WASHINGTON (CNS) — Every time Nathalie Piraino returns home to Rwanda, she sees a country advancing economically and politically and where the development of people, especially women, is foremost. She also has found that memories from her homeland’s genocide 20 years ago remain vivid, not forgotten. Searing memories of the bloodbath that claimed as many as 1 million lives underlie the actions the country of 11.5 million people is taking to become a modern African nation, Piraino said. 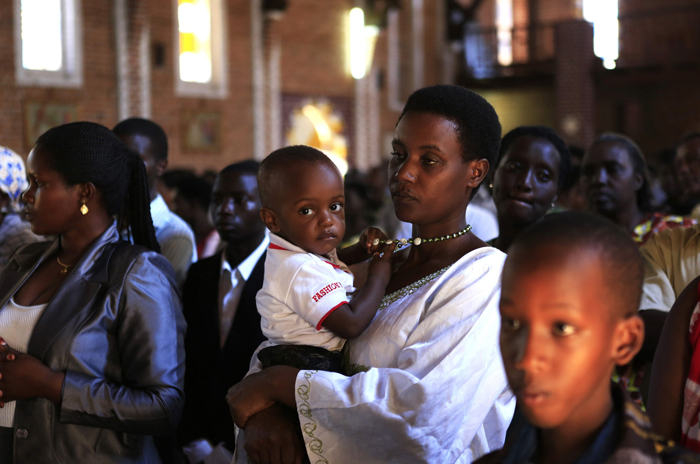 Piraino, who worked for one year at Catholic Relief Services and whose husband, Dave, was the agency’s country representative in Rwanda from 1978 to 1981, lost more than 100 family members during the genocide. Her mother, seven siblings, an uncle and countless nieces, nephews and cousins were killed in and around their village of Karambi by marauders. She told Catholic News Service April 7, the anniversary of the start of the brutality, that her mother’s home was destroyed in the violence. “The whole village was empty. There is no house. There is nothing,” she said, recalling a 2005 visit. Piraino was living in Baltimore when ethnic Hutu militia and soldiers attacked minority Tutsis and politically moderate Hutus. She recalled the last conversation she had with her mother: a phone call near Easter, which fell three days before the onset of genocide. Piraino said she sensed her mother knew the threat of violence was rising and that her mother suggested that she save more money for an upcoming trip to Rwanda and visit months later, at Christmas, instead. It was a year after hostilities ended before Piraino was able to return home. She was shocked by what she saw: destruction, bodies and mass graves everywhere. Piraino said she believes the gruesome violence can be traced to Rwanda’s colonial era, which began in the late 19th century when Germany ruled the small country. Germany later ceded control to Belgium. In the 1930s, Belgian leaders began requiring Rwandans to carry identification cards that indicated whether they were Hutu or Tutsi and granting privileges and services based on those identities, she explained. By the time Rwanda gained its independence in 1962, the prospect for violence was assured among those who felt mistreated, she said. Dave Piraino, who retired as executive vice president for human resources for CRS in 2012, has accompanied his wife on visits to Rwanda. He said he has met Rwandans working around the world and also found that genocide remains foremost on their minds. “It’s something that will always be with them,” he told CNS. Memories of the violence remain vivid as well for Chris Bain, director of CAFOD, the relief and development agency of the Catholic bishops of England and Wales. At the time of Rwanda’s atrocities he was with Oxfam International and was based in England. Bain recalled traveling to Zaire, now Congo, in response to the refugee crisis that developed as the violence surged. By the time he arrived it was Hutu refugees who were pouring in daily from neighboring Rwanda, pushed westward by the Rwandan Patriotic Front led by Paul Kagame, a Tutsi who assumed the country’s presidency in 2000. The campaign by the RPF forces ultimately ended the genocide after 100 days, in mid-July 1994. Based on what he saw and heard from the refugees, Bain determined genocide was taking place in Rwanda. He said he was angered that the British and U.S. governments chose not act to stop the killing. The camps in Zaire, filled with up to 2 million Rwandans, soon were under the control of Hutu militias, and aid agencies could do little to stop mounting violence against the few Tutsis who had fled as well. Without U.N. peacekeepers to step in, Bain said Oxfam and other aid agencies decided to withdraw from the camps. “It was abject failure on the part of the international community,” Bain said of the situation. Bain suggested that perhaps the lessons learned in Rwanda prompted the world to intervene in Sierra Leone and Liberia when mass atrocities appeared imminent. The deployment of British troops in Sierra Leone in 2000 ended a civil war that was headed toward mass violence. In Liberia, West African troops, backed by a small U.S. contingent, ended that country’s civil war in 2003 and eventually led to the arrest and prosecution of former President Charles Taylor for crimes against humanity. Today, Bain sees Rwandans making tremendous strides in rebuilding their nation, but he still recalls how Rwandans turned against each other.